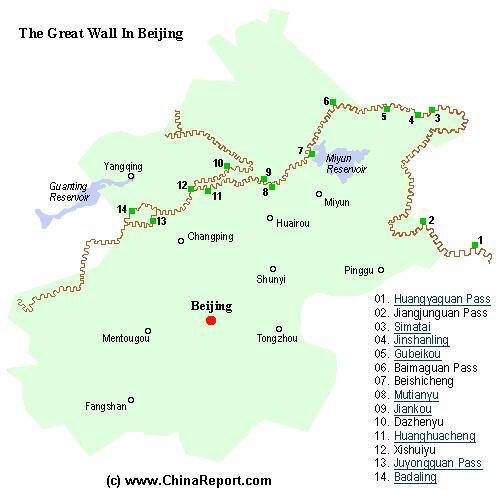 Jinshanling Great Wall of China, Hebei Province (1) Introduction & Travel Directions. Jinshanling Great Wall of China, Hebei Province (1) Introduction & Travel Directions. 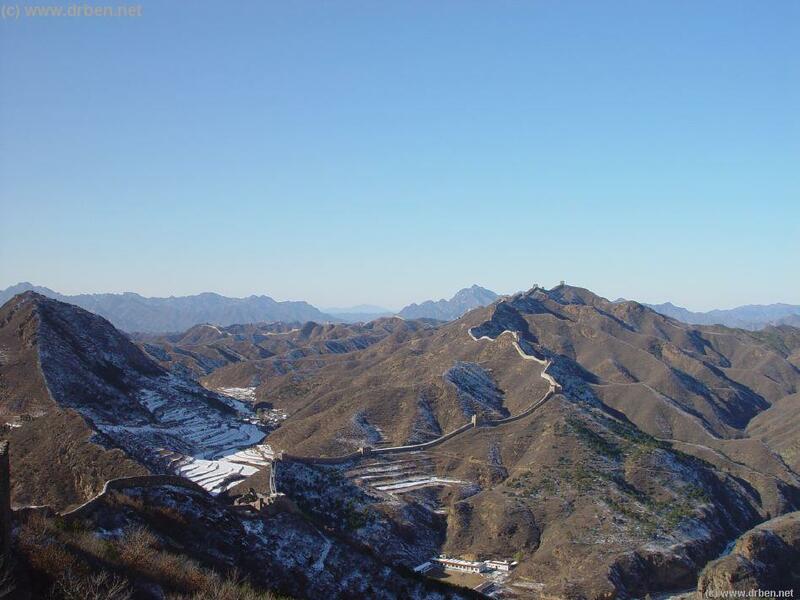 Jinshanling Great Wall location coordinates: 40°41′0″ North 117°14′10″ East. The Jinshanling or Golden Hill Pass Section of the Great Wall of China is located across the Border of Miyun County of Beijing City Province, at a distance of about eight kilometers (five miles) southeast of the Bakeshiying Township in Luanping County in Hebei Province. The Badaling Wall lies in Changping District now an outer suburb of Beijing and Mutianyu Section at 65 kilometers distance also falls under the jurisdiction of Beijing City Province (Municipality). However other even more outlying sections of the Great Wall of China such as Jinshanling, Luowenyu, Panjiakou, Jiaoshan, Jiumenkou, Shanhaiguan, and Old Dragon Head are located in parts of Hebei Province. along a length of 11 kilometers (six miles). At intervals of 100 Meters (328 feet) - sometimes less, only 50 or 60 meters, there are watch- towers each of which is about ten meters (33 feet) high. Each of the watchtowers is truly unique because each tower has a different architecture. The sequence starts off with the Wangjinglou Tower in the east and ends at Longyukou in the west. The Jinshanling Great Wall is 5 to 8 meters high, 6 meters across the base and 5 meters at the top. The walkway along the top is paved with square bricks providing a level surface wide enough to construct or erect batteries. Today this level suface offers the same great sights and the smooth pathways of the Jinshanling stretch are especially popular among hikers. Local tour operators regularly offer hiking trips along the 10 to 11 kilometer long wall. It is also possible to walk from the West along the Jinshanling Section to Simatai. One can even Camp overnight in the Area ! Not all the going on the Wall at Jinshanling is easy going though. Not only is the Wall narrower than for instance at Badaling, atop the Wall are a multitude of 2 meter high DuoKou, Crenels creating small booths from which to attack enemies that already scaled to the top platform of the Wall. Atop is a firing Hole. In the middle of these thinner section walls is a hole, providing opportunity to fire arrow bolts at the enemy. way at an average 980 meters above Sea Level from the Eastern to the Western Horizon has become representative of the Ming Dynasty Great Wall in many advertisements, films and photos. Aware of the easy path of attack available through the easy hills in area, the builders constructed a extra strong defenses including, double walls at strategic points, forts and watchtowers, criss-crossing firing ranges, and a beacon tower alarm system at Jinshangling. Its military fortifications of square, round, oval, and L-shaped buttresses, and embrasured watchtowers which are unique and only found at Jinshanling. According to sources, the unique Wall section was first founded or based on huge stone slabs. After these were in place, havey iron bars were set to form a skeleton. Then huge bricks, each of which weighed about 12 kilograms (26 pounds) were used to construct both the Wall and the Watchtowers. The Jinshanling Great Wall is situated on the Big and Small Jinshanling, hence its name. Featuring various structures and having various functions, those watchtowers are either one tiered or two-tiered. On the first floor there are some windows for shooting arrows. The roofs of the towers are many and varied, flat, arched, quadrangular or octagonal. Some are used to store weapons and hay. Others are used as soldiers' bedrooms. Among them, the most celebrated are the Big and Small Jinshan Watchtowers. 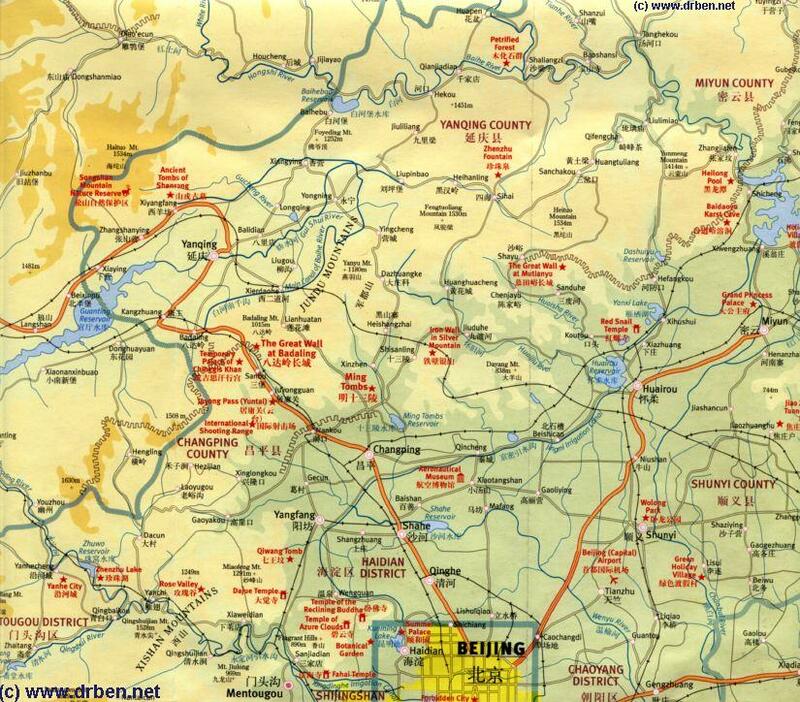 Map of The North Half of Beijing City Province with Huairou County and Miyun County of Beijing, and the Great Wall at Gubeikou (and Jinshanling) delineating the Border with Hebei Province. Best Options: Take the train at Beijing Northern Train Station at Xizihimen or opt for the Eastern Railway Station. In both Cases purchase Tickets to Travel to Gubeikou. When at Gubeikou transfer to the direction Jinshanling Great Wall. Since 2008 AD all signs of trains and schedules are bilingual English/Chinese, so it should be no problem to find your way. In case this doesn't work out, Beijing has grown to become quite an international city. Try find a younger person and ask for directions. It may well be they would love to practice their english. However, dont be gullable on directions. View of the Jinshanling Section from across the River at Simatai. have tickets and arrangements available for anyone. The 3rd Good Option is: Take long-distance bus at Beijing's Dongzhimen Bus station to Miyun county first, then take mini bus to Jinshanling tour area. The Fourth Option, not a Good One is: Go to Xuanwumen Bus Station at the South and Front of the South Cathedral (Nan Tang) and at the intersection of Dong Sishitiao (East 40th Street). This location marks the border of Xuanwu District and XiCheng District and is reachable through the Blue Circular Line 2 and the Aquatic Blue Line 4 of the Subway/Metro System. From XuanwuMen Bus Station Take the Tourist Bus Line No. 12 to go to the Jinshanling Great Wall. Mind you however - This Bus only operates on statutory holidays). Last Option: Hire a Taxi for a Day at a Cost of about 100-120 US Dollars (depending on Oil Prices) and hit the road in Luxury and by yourself. The Cabby can stay the day while you explore the scenery and considerable length of Wall. Jiguang directed building of this section of the Great Wall. Wangjinglou (Lou=Tower) and the Taochun Lou are considered the Highlights on the Jinshanling Great Wall. As do many such places in China, especially on The Great Wall, each tower has a legend Attached to it. In this Case Legend has it that the heavy stone bars used to build the Wangjinglou Tower were carried to the mountain top by Er Lang Shen, the nephew of the Jade Emperor. The general tower on the other hand was named to commemorate Wu Guihua, a heroine who sacrificed herself to resist Mongol Invasion from the North during the Ming Dynasty Era. Jinshanlings' Black Tower and Taochun Tower were allegedly christened to commemorate two girls, Heigu and Taochun, who made great contributions to the construction of the Great Wall. The main section at Jinshanling can either be reached on foot or by an eight hundred meter long (0.5 miles) cable way, both offering spectacular views. The Cabel Car fee does not include entry to the Great Wall. Apart from the main ticketed and official section, there are several so-called "Wild Wall" Sections to be Visited. Beware however of Grumpy Peasants demanding cash for (tres)passing their Land (or so they say, who can verify!). The Wall for Preventing the Horses, the Retaining Wall, the Little Exhibition with Bricks with Old Graffiti and Labels and the Kylin Screen are also renowned and worth a visit. Meanwhile, there is a three-kilometer (two miles) Night Great Wall open to anyone who visits the Jinshanling Great Wall and who can stay the Night. Great Wall, although a small river devides the two sections. Recently a suspension bridge has been assembled to let Tourist cross, naturally (in China) for an additional 5 RMB Fee. The original Jinshanling Section of the Great Wall was built during the sixth century in the period of the Northern and Southern Dynasties (420 AD -589 AD), however it became part of a later and larger Great Wall. At the advent of the Hongwu Reign of the Ming Dynasty, at the very beginning of the Dynasty Jinshanling was among the First Wall sections reconstructed as part of the massive reinforcements applied to the Great Wall during the entire Ming Reign Era. 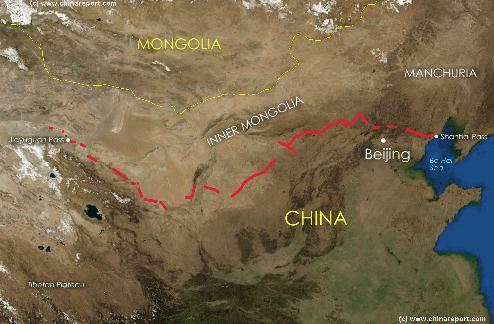 It was part of a national project, as the same time in the Far West, construction began on the JiayuGuan Fortress, the End Fortress of the Great Wall of China some 2000 miles away and the last pass regained on the Mongol Yuan Dynasty Armies. The Jinshanling Wall was repaired and reconstructed at more than one time during the Hongzhi and Zhengde Reigns of the Ming Dynasty. However, by far the most extensive reinforcements and renovations were carried out in the reign of Emperor Longqing and Wanli, in the years between 1567 AD and 1570 AD), leaving basicly the Wall as it remains today. It was restored between 1983 and 1988 AD on orders of the Chinese Government. A Full Google Earth Supported Map of Jinshanling Great Wall by Google.com. 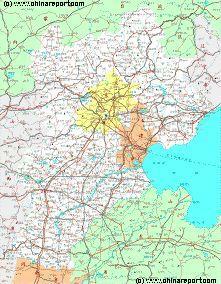 Adjacent Map gives direct access to Jinshanling Map by Google Earth. Sound Bonus: Chinese Classic Traditionalo Folk Song "Early Morning Song" on Bamboo Flute.